Memorial Presbyterian Church, 36 Sevilla St., will celebrate the 125th anniversary of the dedication of its sanctuary March 15. It seems appropriate to do a little polishing up before an anniversary celebration, and the church did far more than “polish the silver” to prepare for the event. 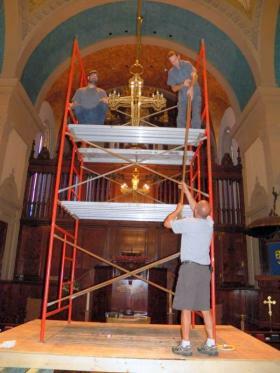 Through the efforts of the Society for the Preservation of Historic Flagler Memorial Presbyterian Church and two members of the congregation, 12 brass torchiers (pew lights) and seven double cruciform chandeliers were polished in an extensive effort to put a shine on the ceremony. None of the brass light fixtures had been polished since the 1890 dedication of the church. The dark look was acceptable since it appeared to look old. In the early years, all the pew lights and chandeliers were gas lit and one recently restored chandelier shows the gas jets. While removing the fixtures for polishing, the old gas lines could be observed and the process of lighting with gas was better understood. The chandeliers hang from high ceilings with one descending from a 100-foot high dome. This is not the type of polishing one gives to a church clean-up committee. The work was paid for by the society, which was formed in 2008 with the intention of reaching out to the community and beyond to help support and maintain a local treasure — the church sanctuary. The Rev. J. Dudley Weaver said, “This important structure needs care and support by this community and beyond.” More than 100,000 adult visitors come through the church yearly. That count does not include the large number of school groups who tour the building. Many visitors remark about the beauty of the church, and the newly polished brass makes it outstanding. The sanctuary is open for tours 9 a.m. to 4 p.m. Monday through Saturday and Sunday afternoons. Occasionally, it is closed for services and maintenance, but the significance of maintaining a museum while still an active church is a responsibility the members take seriously. Memorial Presbyterian Church will provide a “Picnic on the Grounds” luncheon in honor of the 125th anniversary at 11 a.m. March 15. For reservations, call 829-6451. Additionally, at this time of year, Memorial Presbyterian hosts a series of Lenten organ concerts every Wednesday at noon. The concerts are free and open to the public. Donations are accepted. A list of organists is available in the sanctuary or online at memorialpcusa.org.